Football is probably the most admired sport in the world and so the government of Dubai built Football stadiums in the city. Al Maktoum Stadium in Oud Metha is among one such projects by Dubai government that gave its citizens a chance to practice and enjoy the thrilling sport. Besides casual matches tournaments are also organized so that a complete package is granted to the Football fans. Nice sitting arrangement is available for the viewers, besides that a big LED is present so that everyone can view the action that they may not be able to see with naked eye. If you are looking to find further details about the Al Maktoum Stadium then the guide arranged below will provide you relevant information. The football stadium is quite spacious and is known for organizing massive events. For spectators, comfortable seats are available so that they can enjoy an action packed game. The management makes sure that the environment is family friendly and highly secured. Snack shop is also present so that audience can enjoy the match while having refreshments. Since various games are held in the stadium, the timings depend on the event. In order to check out the operational hours of Al Maktoum Stadium, make a call on the number cited in step 3 and arrange your visit or get to know the schedule of the entire week. If you have any queries in your mind or wish to acquire any kind of information form the Al Maktoum Stadium, then the number given as follow will certainly help you out. 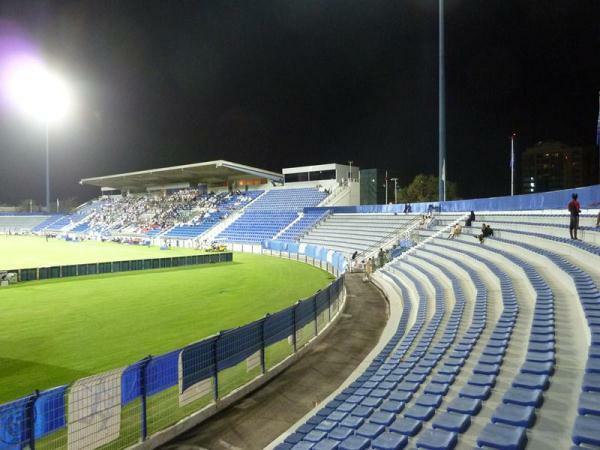 Al-Maktoum Stadium, Umm Hurair Road, Oud Metha, Dubai, United Arab Emirates. Approximately 550 meters away from Al Maktoum Stadium Oud Metha Dubai a bus stop by the name of Nasr Sports Club 1 is present. By walk it will take 7 minutes to cover the extent of distance. From the stop you will have to head in the southwest direction on the 10th St and then take a roundabout. Take the first exit and stay on the 10th St. Take a right turn and cover 130 meters distance then take another right turn and you will reach the destination. For a detail view take help form this follow the map. 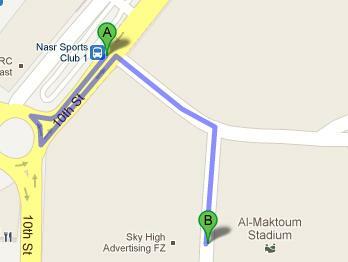 The routes that make a stop at Nasr Sports Club 1 are 42 from Airport Terminal 1 and C4 from Gold Souq Bus Station 4C.